Black Father in Letter to His Son: “I Thought of You When I Saw the Son of Alton Sterling Weeping” | Democracy Now! chair of the Department of African American Studies at Princeton University. He is author of several books, most recently, Democracy in Black: How Race Still Enslaves the American Soul. junior at Brown University and son of Eddie Glaude. Read: "Letters Between a Black Father and Son"
After the fatal police shootings of Alton Sterling in Baton Rouge, Louisiana, and Philando Castile in Falcon Heights, Minnesota, Princeton professor Eddie Glaude sat down and wrote a letter to his son. It began: “Dear Langston, I thought of you when I saw the son of Alton Sterling weeping at a press conference. It was the latest of a string of haunting public rituals of grief. The police had killed another black person. His cries made me think of you.” His son later wrote back, and the two went on to publish their exchange publicly in Time magazine. We speak with both father and son: Princeton professor Eddie Glaude and Langston Glaude, a Brown University undergraduate student. AMY GOODMAN: Those are the words of Princeton professor Eddie Glaude to his son Langston in the wake of last week’s police killings of Alton Sterling in Baton Rouge, Louisiana, and Philando Castile in Falcon Heights, Minnesota. Eddie Glaude was referencing video from the moment when Alton Sterling’s family addressed the media. This is Quinyetta McMillon, the mother of Sterling’s 15-year-old son Cameron. At the beginning of the news confernce, Cameron consoled his mother as she spoke, but after a few minutes, he broke down into the arms of supporters standing behind the two of them. QUINYETTA McMILLON: The individuals involved in his murder took away a man with children, who depended upon their daddy on a daily basis. My son is not the youngest. He is the oldest of his siblings. He is 15 years old. He had to watch this, as this was put all over the outlets, and everything that was possible to be shown. AMY GOODMAN: That is 15-year-old Cameron, the son of Alton Sterling, as he’s being comforted by supporters at the news conference where his mother was speaking. Joining us now, Princeton professor Eddie Glaude, author of Democracy in Black: How Race Still Enslaves the American Soul. We are also joined by his son Langston, a student at Brown University. They recently published their letters to each other in Time magazine. Welcome, both. Welcome, Professor Eddie Glaude. And welcome, Langston. It’s great to have you both here with us. Can you start by reading your letter to Langston, an excerpt? AMY GOODMAN: And then, Langston, we’d like you to share yours. AMY GOODMAN: And, Langston, your letter that you responded to your father. NERMEEN SHAIKH: So could you say something, Eddie, about what prompted your decision to make an exchange like this public? EDDIE GLAUDE: You know, I was really grappling with that 15-year-old boy crying, weeping at the loss of his father. And combine that with Diamond Reynolds’s four-year-old daughter finding the maturity and courage to try to console her mother in that moment, and it led me to think about my own son and his own experiences. And so, part of the difficulty of this conversation around race is that we often deal with abstractions, and we don’t know and we often don’t realize that there are real human beings, real lives, real relationships underneath all of the abstractions. And so I wrote him, and he wrote me back. And in my son’s usual way, he corrected me. I said I wish he was seven, because I thought he would be safe at home again, and he reminded me that Tamir was 12, and he’s gone. So childhood isn’t a safe haven for us, even then. AMY GOODMAN: And just about a week ago, Tamir Rice would have turned 14 years old. Again, Tamir Rice, who was killed by police in Cleveland, where the Republican convention will be held next week. Langston, you’re wearing a T-shirt. If you can tell us what it says, and your thoughts about what’s happened this last week and what you feel needs to be done? LANGSTON GLAUDE: Yes, so, my T-shirt says “I love my blackness and yours.” I’m not sure if you can see it. And the reason why I chose to wear it is because we live in a—we’re living in a time where blackness almost seems to be a death sentence. It almost seems to mean that your life is somehow lesser than others. I wear it often, because the world is constantly telling us to not love our blackness, and I want to change that. I want to somehow make it known that to be black is to be OK, that you can love your blackness, that you should be proud of your blackness, that it’s not simply just a death sentence. 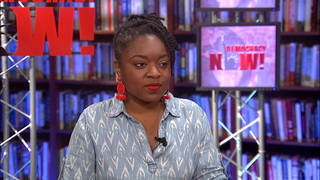 And I think within recent events that that message is very crucial, not just to people in general, but to young black kids, as well, who are living through this time, where they’re witnessing deaths and killings such as these, and such as Alton Sterling and Philando Castile, all the time. So, yeah. NERMEEN SHAIKH: And, Langston, can you talk about your own experience as a student at Brown University, and in particular what happened one day when you were doing research in a public park in Providence? AMY GOODMAN: Your thoughts when you hear this, Eddie Glaude, chair of African American Studies at Princeton, but also father of Langston? EDDIE GLAUDE: Yeah, I had just gotten a call from the American Academy of Religion saying that I had been elected the president of the largest body of scholars of religion in the world. And then my son calls me an hour later to tell me this. And I hear it in his voice. And so, you know, I’m—I was enraged. I was enraged. And, you know, the only thing I could do at that moment was to figure out how to keep the rage and anger in my son from going internal. So I asked him a question. I don’t know if you remember this, Langston, but I asked him a question: Imagine how often someone else would have to experience that, if you lived in a different ZIP code. And part of what I was trying to do in that moment was to get him to turn that experience into a dedication to this justice work—right?—not to go therapeutic, not to go inside, but to go outside. And look at him. So, I’m very proud of you, boy. Sorry. AMY GOODMAN: So, Langston is named for Langston Hughes? EDDIE GLAUDE: Yeah, he’s named after Langston Hughes and Ralph Ellison. His middle name is Ellis. We wanted him—every time—he bears the burden of that name. But every time he says it, we wanted him to understand the power of the tradition that makes him possible. AMY GOODMAN: And what does that mean to you, Langston? LANGSTON GLAUDE: The name is certainly powerful. Everywhere I go, I definitely get questions. And it gives me a sort of pride, especially while doing this type of work, that I can walk into a space and be able to say that my name is Langston. It definitely gives me a different type of courage, especially doing this work. AMY GOODMAN: We’re going to break and then come back to this conversation. Langston Glaude is a junior at Brown University in Providence, Rhode Island, and we’re also speaking to his father, Eddie Glaude, who is the head of African American Studies at Princeton University and has written a new book called Democracy in Black: How Race Still Enslaves the American Soul. Stay with us.